Fenland airfield gets Déjà vu! 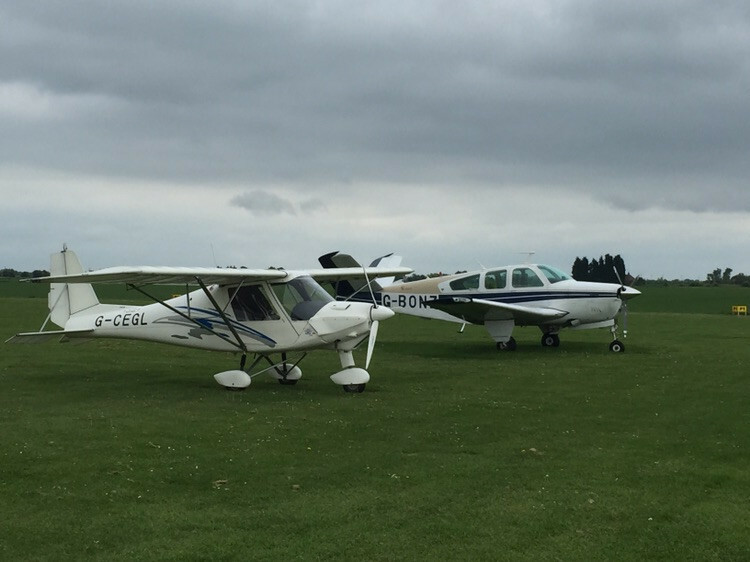 Low cloud 80% chance of rain and no cake at the club things were looking very bleak at the club for my dual and solo to Fenland! To make things even worse Katie and Tom had just decided to land as rain was moving overhead Chatteris airfield, oh well no solo and possible no dual for me today, I thought to myself. With that Mike turned to me and said do you want to go flying? Do you think the weather is OK for your cross country? Well I said, it is supposed to start improving from 12:00 and clear by 14:00 if you are OK with it I’m OK! So I checked the aeroplane over and found it was a little low on oil, Katie duly added a 100ml and this put it back to where it normally sits. 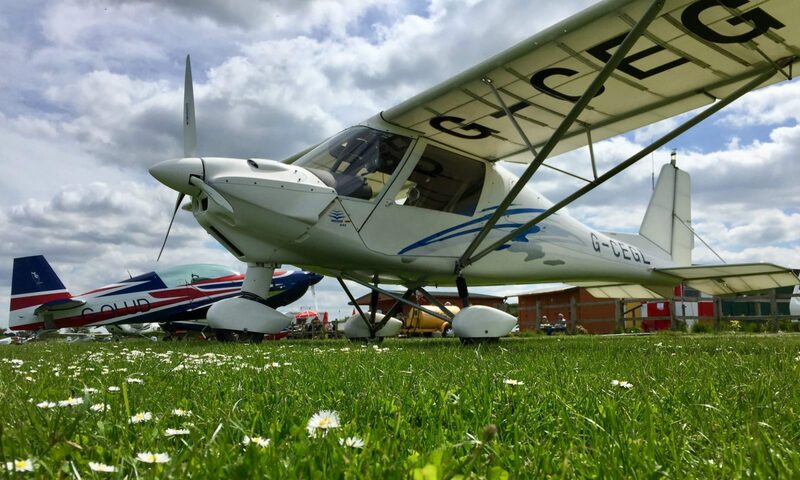 I pulled GL out of the hanger and then phoned Fenland airfield, they were open and the weather was reported as light rain. As I warmed our C42 up, light rain began to come down, but by the time we taxied out it had all but stopped. Off we went towards Chatteris town, over the Forty Foot (or Vermuden’s) drain and turned towards the wind farm to intercept the course, we were at about 1,300ft, but some passing cloud forced us down to around 1,000ft. Whittlesey was our waypoint and not even I can miss Whittlesey with the brickworks chimneys of Whittlesey towering into the sky! The Railway station was my turning point and flying the heading took us directly over it, an almost 90° turn to the right and we were heading to Fenland airfield, at Thorney we were a little left of track, I always seem to end up left of track and I think this is due to a tendency to fly slightly left wing down, I must work on that! With Spalding in the distance and the river Welland in the distance on my left as markers I altered course to the right and I could see fenland airfield in the distance. The cloud base was too low for an overhead join as we had planned to do, so Mike asked how I planned to join now. Remembering the discussion we had earlier that day I knew the joining turn has to be in the direction of the circuit, so my plan as it was a left hand circuit was to fly towards the Base leg downwind meeting point and join there, this got Mike’s approval and as we approached he pointed out reference points for the circuit. The join and the landing all went to plan and we parked up and had a cup of tea! The flight back all went to plan, the rain had gone and the cloud base had lifted to around 1,300ft all the way back and the conditions continued to slowly improved. Back on the ground Mike asked if I was going to add fuel before my solo back to Fenland! My solo was on!!! I refuelled and had a quick bit to eat before setting off. For once I hit all my marks and did not go off to the left. I called Fenland radio and was told to watch out for another aeroplane on long final and asked for my position, I gave it and saw the other plane in the distance, I watched him come in, timing my base leg join so he was on the ground as I joined. Again the landing was good and I taxied over, parked up and paid my landing fee. I had forgotten to take a cross country form to be signed, but luckily the flight school at Fenland let me have one of theirs and signed it for me, a second guy in the school comment it’s déjà vu I saw you here earlier didn’t I! Time to head back, this like the flight over all went to plan too! Previous PostPrevious Boston here I come ready or not! Next PostNext Flying on a Wednesday evening, who would have thought!